The Dastardly Report: The Skiff Reader, the Alex Reader, etc. The Skiff Reader, the Alex Reader, etc. 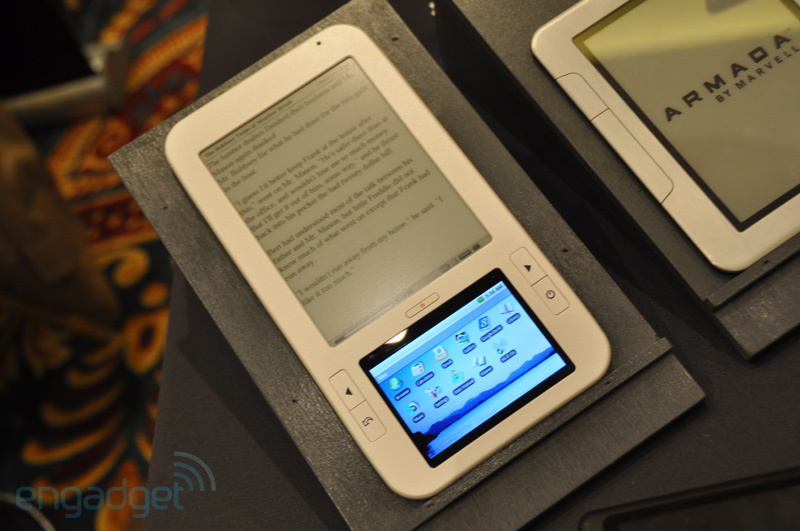 After 3D, the next big push at CES this year is definitely ebook readers. It seems like everyone wants to get in on the game that Amazon has so expertly profited from. And why not? Amazon sold more Kindles this holiday than any other item. That's pretty darn impressive. The market had previously been dominated by Sony and Amazon, with a recent entry by Barnes & Noble. So now, dozens of other manufacturers are interested in getting into the game and it's even getting attention from major players. I'm not going to cover all of them here, just two of the more notable ones. If you're interested in reading about all the newly announced ebook readers, head over here. This is the official Hearst ebook reader that they likely hope to use to increase newspaper and magazine subscriptions. The ebook is powered by Sprint's wireless network and will even be sold in Sprint stores. The reader itself is huge, with an 8.5 by 11 inch screen (the size of a sheet of paper), is only 1/4 inch thick, features a full touchscreen that is made of a new type of plastic that promises to be scratch proof and shatterproof. Some have speculated that Hearst and Sprint might subsidize the price of the Skiff for people who subscribe to magazines and/or newspapers. This is definitely a possibility and I'm curious to see how it plays out. Early reviews of the Skiff are positive and depending on how it's sold and priced, this could be a big player in the ebook reader space. Read more about the Skiff here, here, and here. You may have heard of this reader already, what with all the controversy and legal battles with Barnes & Noble. The Alex is the perfect reader for geeks who know about hardware, but may not appeal to the mainstream user. It features two screens, similar to the Nook. The upper screen is e-ink for book reading, while the lower screen is a touchscreen running full Android. It can browser the web, download apps...everything a standard Android phone can do. Anything that you view on the lower screen can then be "printed" up to the upper screen for easy viewing. There's a Google Books application that lets you browse through free books and then read them on the upper screen. You can even view webpages on the upper screen. All around, this is a really unique ebook reader that has a ton of extra features added for good measure. Spring Design just announced a partnership with Borders, too, so the Alex will now compete directly with the Nook. Read more about the Alex here, here, and here. The ebook reader market is exploding and it's easy to see why. It's a device with a large screen, very easy on the eyes, and can carry thousands of books. Book reading on a phone, even one with a large screen like the Droid or iPhone, just isn't a good experience both due to eye strain from the LCD screen, and the fact that the screen is too small to comfortably read a long novel. Ebook readers are appealing for the same reason the iPod was so appealing when it was released...a single device that comfortably and easily stores all of your content. However, like we see happening with the iPod, I think ebook readers as we know them today have a limited lifespan. They seem more of an interim device to me. Some companies are already showing off coler e-ink displays, and tablets are all the rage this year, especially with rumors that Apple may launch a tablet soon. So it's only a matter of time before we start seeing true multi-tasking devices. Thin tablets that have hybrid e-ink, OLED screens, for example, that can comfortably browse the web, then switch to easy-on-the-eyes book reading. The current crop of ebook readers, in my opinion, will be very short lived. I predict that within 2 or 3 short years the Kindle of today will be long forgotten and replaced by devices that are drastically more functional. UPDATE: Gizmodo wrote an excellent article today about an alternate to e-ink and the future of devices like this.